The first sculptures of Buddhist art known to us were made of stone. Figures of very great proportions also came in tiles covered with stucco and gold. Antique statues are rarely in marble, because this calcareous material quickly loses its beauty in tropical climates and is hard to find. From a part of a research project on subject of Southeast Asian Sculpture at the Los Angeles Country Museum of Art, serious consideration is given to the problem of authenticity of sandstone sculptures. Although this study has not yet been completed, technical criteria for authenticity have been defined and a number of authenticity studies have been completed. The purpose of these authenticity studies is to identify technical characteristics, specifically physical properties not visible to the naked eye that could confirm the date of manufacture of each sculpture examined. 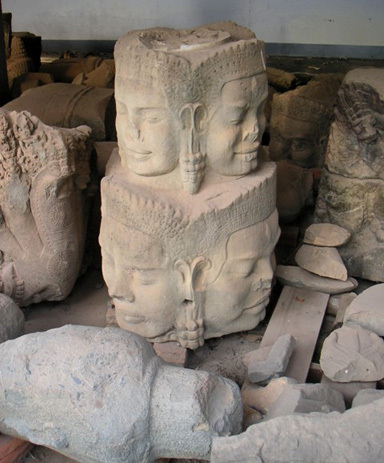 The project entails applying the scientific and technical criteria outlined in this chapter to as many Khmer sculptures as possible, including objects in both private and public collections. Sculpture of known provenance particularly objects in long-standing collections such as the Phnom Penh and Guimet museums, can be used as standards to which the unprovenanced sculptures can be compared. Ultimately, the goal is a set of proven criteria for authentication and provenance questions. To this end, the author has examined a number of sculptures that are being published in this book, the data from which will be part of the larger LACMA project can be published in the future. No tests are known that allow the determination of the date of manufacture of a stone sculpture, i.e. the date of the carving of the stone. A study of tool marks could in theory differentiate between the use of old and modern tools. 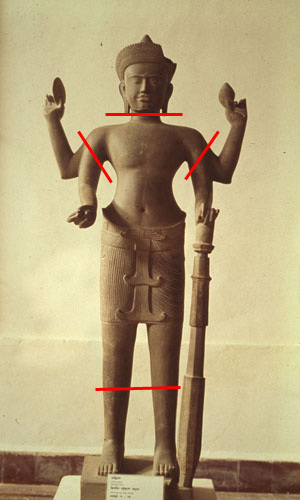 However, since the type of sandstone used in Southeast-Asian sculpture does not accurately register tools, this method is of no use. Any clues on authenticity have to come from changes in and on the surface of stone. Sculpture made 800 to 1400 years ago has been subjected to a long-term natural erosion process, including burial or being exposed to the atmosphere, and possibly also when in use as a spiritual or decorative object. Artificial corrosion and encrustations are sufficient indication that an item is a fake. Stone is hard but not elastic and therefore tends to break of subjected to hard knocks. If only the tip of the nose is missing - not necessarily detracting from the beauty of the object - and the rest of the figure is intact, the item should be analysed by an expert to ascertain its authenticity. Some of the changes to the stone surface can be unique long-term aging. The complexity of these altered surface makes it possible to conclude with some confidence that an object was manufactured "a long time ago," or, in other words, that the technical characteristics are "consistent" with the suggested date of manufacture essentially "authenticating" the object. Such conclusions are based upon the assumption that modern copies do not exhibit an eroded surface, and that the artificial aging procedures to which modern forgeries have been exposed do not result in the specific surface alterations typical for authentic artifacts. Stone surfaces are being examined visually and through a stereomicroscope. Even though all objects examined are sandstone, certain physical characteristics of the stones vary. The major constituent in all the sandstones is quartz, in the form of distinct particles. The sizes, shapes, and colors of the quartz particles can be very different. There are usually also other minerals present, such as feldspars, pyrites, mica, and others. Some of the sandstone is relatively hard, with individual quartz particles firmly attached to the matrix, while other sandstone has become softer, individual particles may have become brittle, and the binding medium has often deteriorated. The features that are significant in authenticity studies are based upon characteristics caused by natural chemical weathering, or composition of accretions. 1. Chemical weathering causes an erosion layer at the surface. This layer can very from less than millimeter up to several centimeters deep. It tends to be more porous and softer, and may show different coloring within the weathering layer. Weathering will effect individual mineral particles at or near the surface more extensively than those further in the interior of the stone. Some of the minerals will resist erosion while other may decompose. On a microscopic scale this "selective erosion" is observed as complete or partial chemical decomposition of individual mineral particles or as rounded or etched mineral surfaces on these particles. As expected, well-polished dense sandstone will show on average much less erosion. But even when eroded, the original polish on the stone's surface may be preserved on erosion-resistant inclusions. 2. The composition of the accretions on the surface reflects the sculpture's history and its environment. Accretions commonly found on Cambodian sculpture include paint, soil (clay, sand), root fragments, and deposits left by mold and lichen (microbiological remains). It is likely that parts of many statues were originally painted. 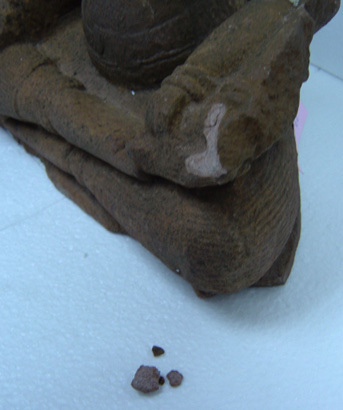 Not surprisingly, paint did not survive well on Cambodian sandstone sculpture. However, some objects still retain traces of paint, including the ground applied to the stone surface before the object could be painted. Much of the soil deposits cannot be considered to be indicative of age or authenticity, except when they contain evidence of long-term natural processes. An example is the presence of root marks. The presence of roots itself indicates a prolonged exposure either on or in the ground, but it does not necessarily indicate authenticity of the object. However, roots often become lodged in surface deposits or become encapsulated. When the roots decompose, they leave only their impressions in the accretions. The presence of root impressions or root pseudomorphs is considered the result of a long-term process and supports authenticity. The detailed description of microbiological deposits and the effects of molds, fungi, and lichen on sandstone surfaces is outside the scope of this essay. The subject has been extensively studied in the context of stone deterioration. What is significant here is the notion that molds, fungi, and lichen leave inorganic deposits on the stone surface. Some of these deposits could conceivably be induced artificially, but other require a slow and lengthy process. Most significant is the presence of black spots. Even though their exact composition is not known, they are known to be the result of microbiological action. They contain a relatively large amount of manganese oxide. They will be referred to as "manganese -oxide" spots. They are not the only deposits observed in this category, but they are the most characteristic. Authentic stone figures can be distinguished from unauthentic ones only by analysing encrustations and alterations to the surface. Spectroscopic analysis is method of first choice, since it permits genuine calcareous encrustations and fossilized mould to be clearly distinguished from fake crusts made of glue, cement or chalk. For an expert eye a good microscope is sufficient to detect a gross fake by the signs of age on the stone surface. No connoisseur or dealer would think of removing natural signs of age, because an object would lose credibility and therefore value. A clean stone surface purported to be nearly a thousand years old should make a collector wary. 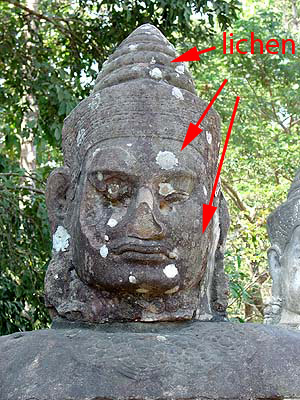 Many Khmer stone forgeries can be identified because the artificial treatment of the surface is obvious when viewed through a stereomicroscope. Certain soil applications, the presence of adhesives in accretions, the use of oil or resin to imitate discolored surfaces, the lack of erosion penetration, the even structure of individual crystals, or the presence of stone-carving debris among freshly shattered quartz crytals, are some of the properties seen in forgeries. However, there may well be sculptures where stereomicroscopic examination may not be conclusive. In such cases a careful petrographic study and/or a characterization of the sandstone source may provide more useful authenticity criteria. Complications in microscopic authenticity studies may arise as a result of recent cleaning and restoration. Such treatments alter some of the surface properties and could in principle remove accretions, deposits, and even an entire surface layer of the stone. In some instances, photographs of the objects before cleaning are available, which may be very helpful in determining the extent of cleaning that was required. The high transport costs of the heavy stone prompted local art dealers to sell the heads of statues first and only much later the headless bodies, with which temples now abound. The standing Buddhas of the Khmer met with particular favour in the West. With their clean, simple lines they looked good in modern homes and demand was so great as to foster their mass production in simplified headless and limbless versions. 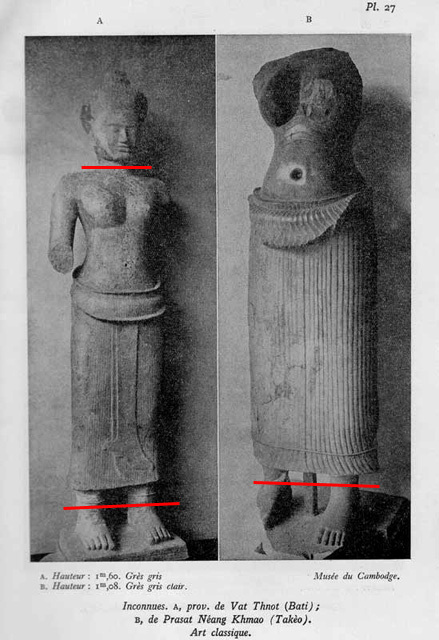 And old photo testifies the condition in which these statues were found in the corridors of the Khmer temples and how they are now produced for the market (red lines). Most of them still had a head, legs and feet. It takes skilled carvers to execute these "details", whilst the fake Khmer objects produced by the hundred every month by common stonemasons are limbless. Stone cannot be dated scientifically. But a surface showing scientifically identifiable signs of having remained for a long time in a tropical climate or underground lends plausibility to a dating based on art historical considerations. Bunker, Emma C. & Latchford, Douglas . Adoration and Glory - The Golden Age of Khmer Art. Chicago (USA): Art Media Resources, 2004. Groslier, George. La sculpture khmère ancienne / Illus. de 175 reproductions horstexte en similigravure. Paris (France): G. Crès, 1929. Matthaes, Gottfried. The Art Collector’s Handbook: How to tell authentic antiques from fakes, Vol. 3 Excavated Art, Asian and African Art. Milano (Italy): Museo del Collezionista d’Arte, 2002.